Shmee Is Playing The Witcher 2! The Steam sale is a wondrous thing. Just when E3 got me all excited for The Witcher 3: The Wild Hunt, Steam went and put The Witcher 2: Assassins of Kings on sale for four dollars! 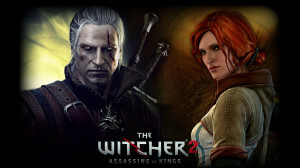 I played the first Witcher quite a bit, but I never finished it because it was really hard, and my manly pride didn’t let me reduce the difficulty. CD Projekt RED really amped everything up for this sequel. The combat is better, the graphics are better, the story makes sense, and now that I have so little pride left, I don’t mind playing it on easy. Honestly my only complaint this time around, is that while the areas look wide open they are actually a series of paths, and you can’t veer off those paths at all. You want to walk through those shrubs? To bad there is a leaf in the way you can’t walk past! You need to walk all the way around. You want to drop off that slight ledge? Do dice! Still this is a story based action RPG, so walking through shrubs and off ledges is more a nice-to-have instead of a need. I have been having a lot of fun with this game, and it has made me glad that I upgraded my computer so I am able to run it. Even though the Steam sale is over you can still get this game cheap, and it is well worth your hard earned money! Previous PostPrevious Ex-Superman To Play The Atom On Arrow!